City of Dislocation is an extensive project conceived and developed by architects Johanne Borthne and Vilhelm Christensen, curator and writer Martin Braathen and architectural historian Even Smith Wergeland in collaboration with OSLO PILOT curators Eva González-Sancho and Per Gunnar Eeg-Tverbakk. The Norwegian economy may have peaked. It is therefore fitting to ask: What where the most prominent societal achievements during the economic rise? The “Consolidate or Die” project deals with this question from a cultural policy point of view, with a particular focus on urban development, the building boom and the fusion of significant cultural institutions. Why have all the big cultural buildings been placed along Oslo’s waterfront? Which plans are in operation in order to maintain the vacated buildings? What are the reasons behind all the institutional consolidations? “Consolidate or Die” is the first exposure of the overarching project City of Dislocation, which is a two-year investigation of important historical landmarks about to be vacated as newly merged institutions move into new headquarters. The first part of the project explores five iconic buildings: The National Gallery, the Museum of Modern Art, Oslo Public Library, The Munch Museum and the Museum of Decorative Arts and Design. The starting point of this exploration is the fact that Oslo faces a historic challenge. An increasing number of the city’s historical buildings are being abandoned and face closure as cultural and social institutions relocate to new, custom-built structures. The astonishing pace at which this is happening not only leaves behind a trace of buildings reduced to empty shells, but also drains traditional neighbourhoods of their biggest architectural and institutional assets. It is no coincidence that so many significant buildings are being vacated in such a short span of time. Even though there is a specific story behind each building, there are also similarities at play: real and imagined growing pains of the respective institutions, political visions of culture as a magnet for tourists and investors, and a strong belief in contemporary architecture as a solution to institutional challenges. These trends are intrinsically linked to a period of explosive economic growth, which has created a political climate in which fast-paced public expenditure on new cultural buildings has become commonplace. Consolidation is a keyword. Behind these processes of urban change, institutional fusions and architectonic reconfigurations lies a strong political will to consolidate. The Norwegian state has welcomed institutional consolidations since the mid 1990s, and the city of Oslo has followed along the same trajectory by gathering many of the consolidated institutions in one area: the Fjord City. 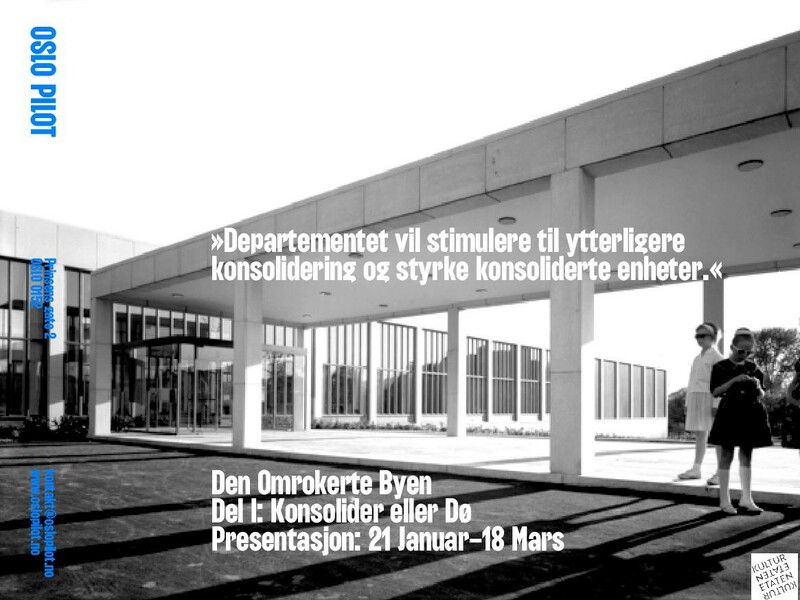 This consolidation phenomenon obviously comes with a number of consequences with regards to cultural and institutional identities, urban planning, architecture and the neighbourhoods of Oslo. Some of these consequences are highlighted in “Consolidate or Die”. The Norwegian economy has been in decline since 2013. The following question seems justified now that the oil extravaganza may be a thing of the past: What where the major societal achievements during the period of economic growth? The cultural field in Norway has definitely reaped some of the benefits. 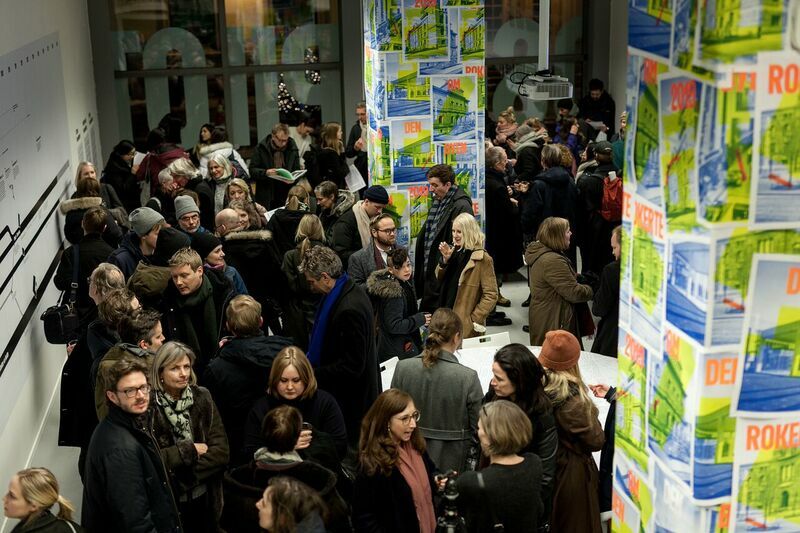 “The years after 2005 represent a period of rapid expansion for Norwegian cultural policy-making”, claims a state level report [Kulturutredningen 2014] on investments within the Norwegian cultural sector. The numbers are crystal clear: Government expenses on culture doubled in amounts between 2005 and 2013, from approximately 5 billion NOK to 10 billion NOK. A concrete manifestation of this expansiveness is a building boom of vast proportions. New concert venues and other kinds of cultural buildings have emerged all across the nation at an unusually fast rate. The economic welfare increased among ordinary citizens as well during the same period, thus setting the scene for the copious public spending spree. It was suddenly legitimate to launch new, large and ambitious projects–in sharp contrast to the fairly widespread myth about Norwegian sobriety. Norway’s cultural field was subjected to a number of assessments during the 1990s. These assessments highlighted a number of negative issues related to the existing portfolio of cultural buildings. Many of them, it was claimed, were poorly maintained, too small, too impractical and generally out of tune with contemporary ideas on how to display cultural content to an audience. 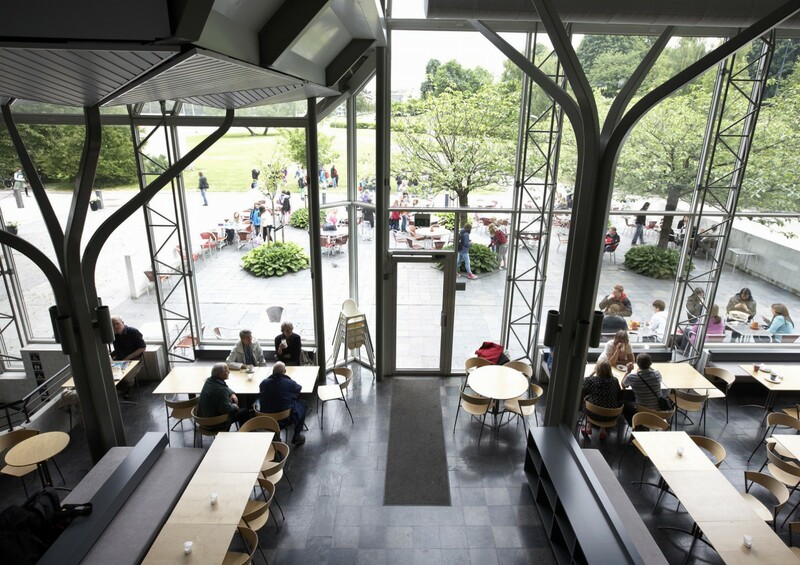 The Norwegian state therefore pointed out a new course for cultural policy-making. One specific concept became particularly important in this quest for new strategies: Consolidation. Heavy economical investments were combined with a series of institutional consolidations, with the aim of streamlining the daily operation of each institution and make it easier to finance new cultural buildings. An important reason why this model became so authoritative during the 2000s is the fact that it appealed to both sides of Norway’s political spectrum. Conservative and socialist governments have been alternating relay batons, so to speak, by clinging to the same ovcultural policy principles. There are minor differences at micro level, however, but the overarching strategy is so congruent that the relationship between political decision making and implementation has been extremely consistent, despite government changes. This is one of the key reasons why Oslo is currently faced with an unprecedented challenge: Within the next few years more than twenty of Oslo’s biggest institutions are going to leave their purpose-built headquarters, either because of rellocation or closure. This process generates a network of voids and empty buildings in every neighborhood of the city. 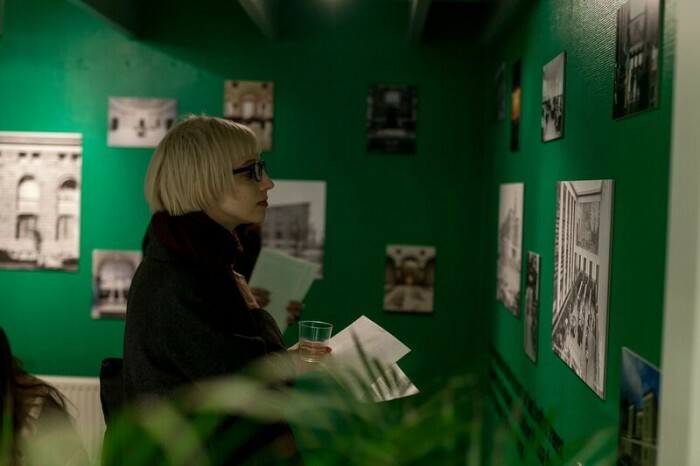 It also directs the attention towards a void inside the archive of cultural policy documents, which have neglected the existing buildings whilst promoting a strong belief in the splendour of new architectural icons. This belief in the wonders of consolidation was further cemented in Gov-ernment report no. 22 (1999-2000), ‭Knowledge and Culture Arenas ‭[Kjelder ‬‬til kunnskap og oppleving], which states that institutional mergers is the optimal solution for Norwegian archives, libraries and museums. After this point, the institutions were forced to reinvent themselves and establish new constellations and collectives in order to be able to compete for public funding from the state. In simple words: They had to consolidate or die. Some of the merged units struggled to handle the expansion turmoil. 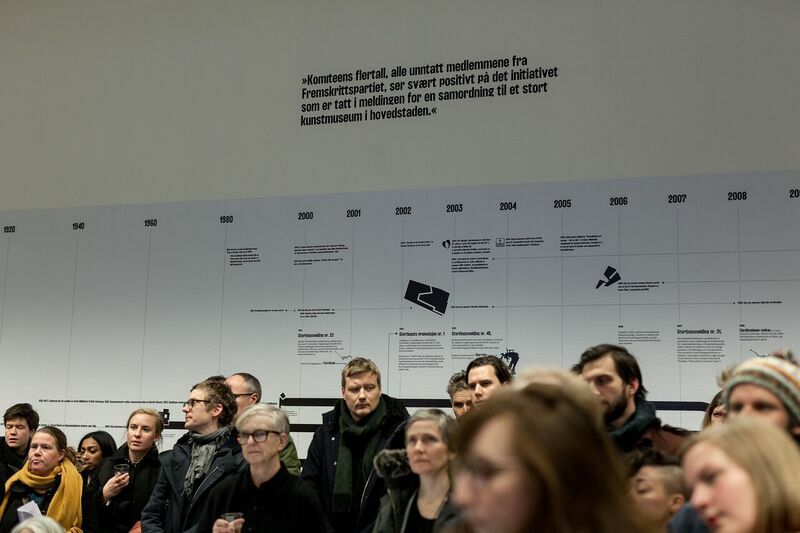 The National Museum in Oslo went through a period of internal conﬂicts and outrage, as exposed in a 2009 master’s thesis by the Norwegian political scientist Håkon Krogenæs. As Krogenæs explains, each unit represented a distinct organizational culture and they had diﬀerent attachments to the Norwegian state and the Oslo municipality. 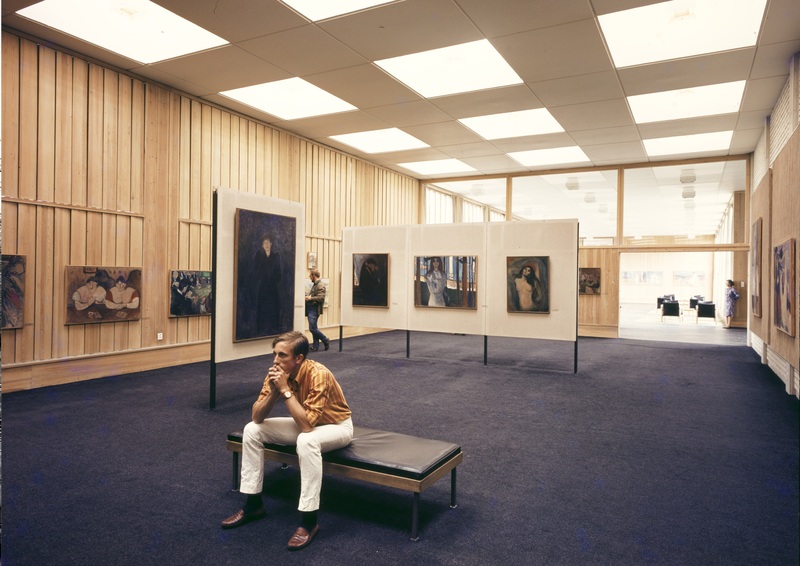 The ﬁrst director of the National Museum, Sune Nordgren, added more complexity to the process by opting to dissolve all existing organisational structures. There were also major uncertainties regarding a new museum building. This had been an unsolved issue ever since an architectural competition in 1972, which amounted to nothing. This indicates that institutional and physical consolidations are often inter-related matters. In addition to fuelling various external consolidations, the state bureaucracy also staged a number of self-consolidations. 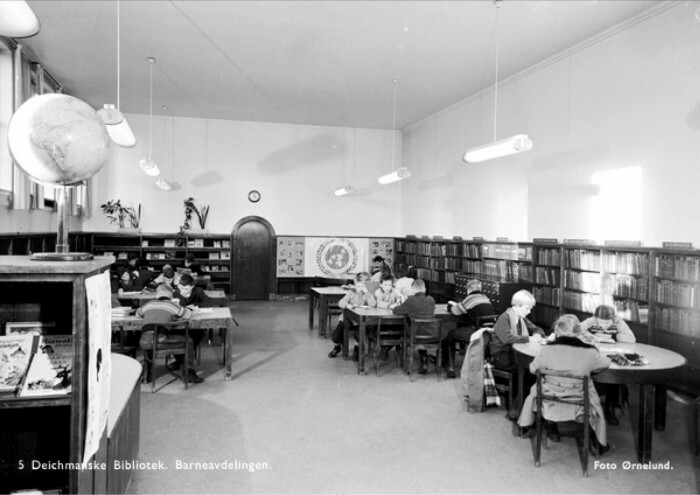 One example is the establishment of a joint organ for coordinating and developing all archives, libraries and museums (in tune with the so-called ABM reform), which was a consolidation of the national library agency, the national library service and the Norwegian museum agency. This merger disbanded in 2010. Some of the units re-emerged the same year as part of the newly founded Norwegian council for cultural aﬀairs. The will to consolidate has, in other words, continued to exert its inﬂuence on Norwegian society. The state level consolidation policy has aﬀected the entire nation, but few areas have felt the impact more strongly that Oslo’s Fjord City – a physical manifestation of the new cultural policy aspirations. It began when the Norwegian parliament decided to place the new national opera house in Bjørvika, a Fjord City neighbourhood, in 1999. The Oslo municipality followed suit by launching the Fjord City plan, which in turn led to a zoning plan for Bjørvika in 2003. The trend has been almost universal since the: Every major player in the cultural ﬁeld wants to move premises to the Fjord City. This trend is closely linked to the main ambition of the Fjord City plan: To create an attractive waterfront, in tune with the emergence of cultural planning as a big trend at the turn of the Millennium, inspired by books like On Competition ‭(1998) by Michael Porter and ‬The Rise of the Creative Class (2002) by Richard Florida. A much-reproduced hypothesis was that culture was the winning card in a globalized world market by interurban competition. This inspired many Western cities to develop along strikingly similar patterns. The establishment of Oslo’s waterfront is a city-level consolidation, clearly inﬂuenced by a state-level report from 1996, ‭Museum. Diversity, memory,‬ meeting place‭ [Museum. Mangfald, minne, møtestad]. The urban puzzle we ‬refer to in this presentation as ‭The City of Dislocation ‬originates from this‭ ‬very report, which contains not less than six potential displacement scenarios involving existing and future cultural institutions in Oslo. All ﬁve institutions included in ‭Consolidate or die ‬were pieces in this puzzle. 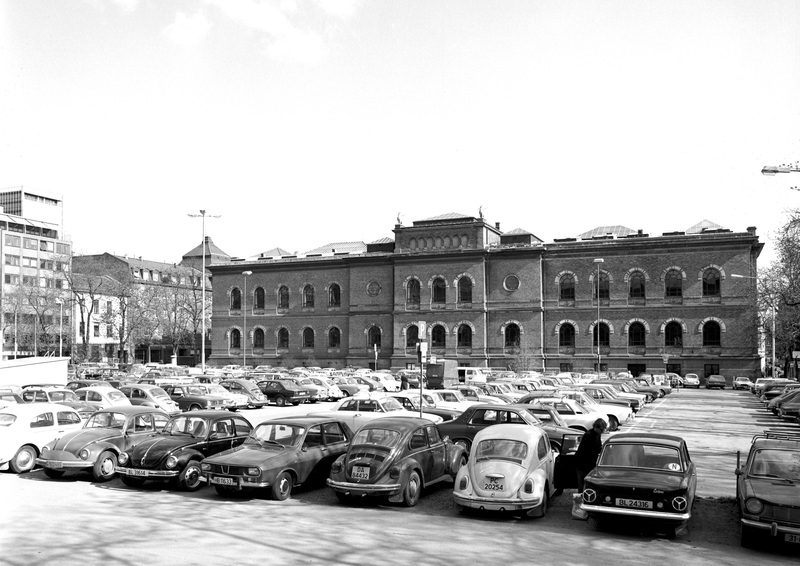 A particular mobility pattern has been evident since those days – from various spots around Oslo down to the waterfront. Public institutions made the ﬁrst moves, soon followed by agents from the private sector. The Astrup Fearnly museum was the ﬁrst big private cultural institution to arrive, with the opening of their new headquarters at Tjuvholmen in 2012. It seems like everyone has bought into the Florida-inspired belief that a concentration of important cultural arenas in one particular area will beneﬁt the entire city. Now, however, in light of a residing Norwegian economy and various critical attacks on Florida’s theories, one might surely ask what the Fjord City consolidation actually has achieved on behalf of Oslo as a whole. The consolidation wave does not seem to quiet down, regardless of how one choses to answer that particular question. The next step may be a concert hall at Filipstad, where the Oslo Philharmonic Orchestra may end up as one of many tenants inside a huge hotel and congress centre. Meanwhile, prominent cultural buildings are left to their own devices elsewhere in the city, discarded as obsolete. The areas in which they remain are also obsolete, doomed to possess the undesirable leftovers from the battle for attractive plots along the fjord. From the opening of City of Dislocation – Consolidate or Die. Historical photos of buildings included in City of Dislocation – Consolidate or Die.